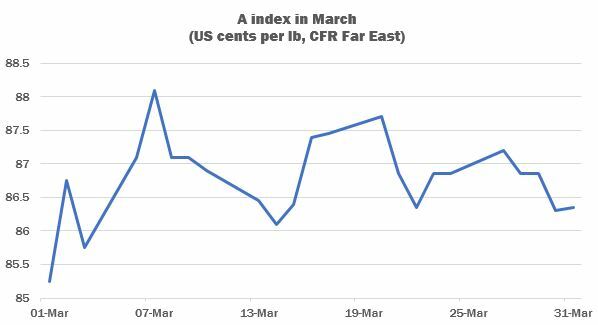 International cotton prices climbed higher early in the period, to place the Cotlook A Index at its highest point during the season so far, on March 7. The A index opened the period at 85.25 US cents per lb and subsequently fluctuated higher within a range of a few cents, ending the month at 86.35 cents per lb. 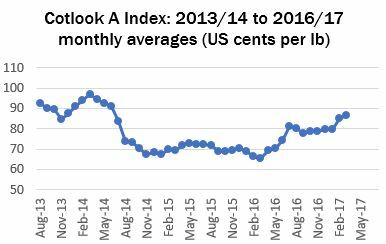 The average of the A Index for the month of March was 86.78 cents per lb, the highest value not only of this season thus far but since June 2014. New York futures continued to be influenced by the still considerable volume of mill fixations outstanding against ‘on-call’ purchase contracts, as well as by the uncommonly large speculative long and trade short positions. The ‘inverted’ relationship between July and December futures persisted. The ‘spread’, which at the time of our last review was just over 300 cent points (July premium), had risen by the end of March, to 450 cent points. March 24 saw the introduction of the Forward (2017/18) Cotlook A Index, reflecting cotton for shipment no earlier than October/November. The initial value, at 84.15 cents per lb, represented a discount of 2.70 cents in relation to the Current Index. By March 31, the gap had widened modestly, to 3.85 cents per lb. Mill buying remained concentrated on US cotton, which retained its competitive advantage on price and availability considerations, with the result that impressive weekly export numbers were reported throughout the month of March. The now fairly well-sold nearby position has contributed to the firming of basis levels. In its March 9 assessment of domestic and world supply and demand, USDA increased its estimate of US exports in the current season by 500,000 bales (480 lbs), to 13.2 million (though the impact on ending stocks was mitigated by an increase in the production figure). By the week ended March 23, cumulative sales of all cotton were already slightly above that revised projection, prompting market observers to suggest that a further increase appears likely. Demand remained focused on cotton for nearby delivery as spinners generally were reluctant to commit themselves to forward purchases (although some 2017/18 crop African Franc Zone cotton found buyers during the period, as well as Brazilian new crop). While US dominated attention, demand for Australian gradually became more prominent, as spinners looked to cover their second quarter shipments. By the end of the month, Australian was relatively well sold for the earlier new crop shipments (April and May). In the last days of the month, Cyclone Debbie brought destruction to Northern Queensland, and briefly appeared to threaten the cotton crop, at least from a quality standpoint. In the event, cotton appears to have escaped major damage, though production estimates had already been adjusted downward, to reflect the impact on dryland yields of the recent extreme temperatures. Indian export offers remained a peripheral influence on the world market, owing to the continuing firmness of local prices from that origin. Indeed, import demand from the same market appeared was a far more noteworthy feature of trading during March, directed to West African (when available), Australian and US cotton. By March 23, US upland sales to India amounted to more than 588,000 running bales, more than a seven-fold increase from the corresponding figure a year earlier. 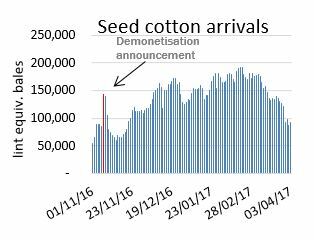 Seed cotton arrivals declined from mid-month and, although the consensus remains that farmers have been slow to release stocks to market, the prospective size of the crop came under further scrutiny, with some observers adjusting their ideas lower. Cotlook’s assessment of Indian production in 2016/17 was lowered by 500,000 local bales (170kgs), to 34 million bales, slightly higher than the previous season, but still considerably below the five-year average. The principal development in China during the month was the highly-anticipated start of this year’ s State Reserve auctions, which began on March 6. Last year, the auction series resulted in an impressive reduction to government stocks, of 2.6 million tonnes, leaving a remainder of roughly 8.5 million. The expectation is that a similar volume will be disposed of during the current series, provisionally scheduled to last until the end of August. The series opened to vigorous trading, with virtually all of the catalogue offered being taken up in the first week or so, following which buyers took a more selective approach to buying, in part on quality considerations. By the end of the month, cumulative purchases had nonetheless risen to more than 465,000 tonnes. From an international market perspective, the principal significance of the outcome of the auction series hinges on the extent to which Chinese reserves will be reduced, and the point at which a shift in import policy might subsequently be considered. The prospect of a relaxation of import controls (which since 2015 have been limited to the 894,000 tonnes required by the WTO) has been on the minds of traders for some time, though whether depletion to perhaps six million tonnes, should the current series match last year’s total, will be enough to persuade Chinese authorities to loosen restrictions remains a topic of debate. Cotlook’s tentative assessment of the outlook for global supply and demand in 2017/18 has undergone little change since its initial release in February. Modest adjustments were made to production in several the African Franc Zone countries, but the major change was to the figure for China, which was increased by 270,000 tonnes, to 4.84 million. The increase in China is attributable to Xinjiang, where good weather and preferential government policy have boosted output prospects. On March 31, USDA released its customary assessment of Prospective Plantings during the season ahead. At 12.2 million acres, the figure for cotton proved to be at the upper end of trade expectations, an increase of 21 percent from the area sown to the 2016/17 crop. The forecast is 1.2 million acres above the number advanced the previous month by the National Council of America, the figure on which Cotton Outlook’s forecast (roughly 17.5 million bales) had hitherto been based. Attention will turn over the coming weeks to the weather pattern in the key West Texas producing region, where shifts in yield and abandonment can exert a major influence on forecasts of the US crop. On the consumption front, Cotlook’s numbers are barely altered on the month and an improvement between seasons of 2.3 percent remains in prospect, though the strength of recent mill demand has prompted some trade observes take a more optimistic view of mill use. 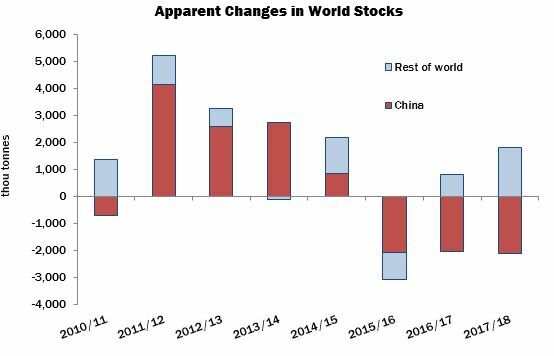 Global stock levels outside China are expected to rise by just over 1.8 million tonnes by the end of 2017/18, on top of the increase of 817,000 tonnes anticipated at the end of the current season. The rise outside China, however, is expected to be more than offset by a second consecutive reduction of stock levels in that country, as the state reserve auctions unfold. World stocks at this very early juncture are expected to decline by 317,000 tonnes. Although the above numbers will remain subject to substantial change as a clearer picture emerges, at present the outlook for rising stocks outside China threatens to put pressure on international prices next season.